Hedges have been with us for thousands of years: the first recorded example of somebody complaining about trimming their hedge dates back to the Neolithic Age, roughly 2,000 to 4,000 years BC. Luckily for us, we have access to power tools that our ancestors could only dream of. But which is the best hedge trimmer for you? Now that summer is a-coming in, you'll soon be in need of one. The best hedge trimmer really depends on the hedge you have, and your own personal preferences: good luck trimming hundreds of yards of ancient hedgerow with a tiny handheld. There are hedge trimmers that extend to save you leaning on ladders, trimmers that turn into chainsaws for really thick branches and trimmers with swappable heads for different kinds of work. As with most power tools the main choice is corded or cordless: battery-powered devices’ running time is of course limited by their battery, but corded trimmers run the risk of accidentally cutting the power cable. Always put an RCD on the plug your power tool’s connected to. It’s worth mentioning that the RSPB would prefer that we didn’t cut some kinds of hedges between March and August. That’s because some birds nest in hedges, so for example in Scotland gardeners have been asked to keep their clippers in the garage until sparrows have fled their nests. These are our pick of the best hedge trimmers we’d recommend for every kind of job and budget. This extendable cordless hedge edger lets you trim without need for a ladder. For a cordless model, the Gtech HT20 is light-ish at 2.25kgs and well designed. It couldn’t be simpler to assemble as it’s comprised of just four parts: a blade housing, a control handle, a 90cm aluminium extension arm and a small, lightweight 18v Lithium-Ion battery. It’s a shame you can’t remove the extension arm and use just the bladed end for waist- and eye-level trimming but at least the blade assembly can articulate through 135 degrees so it isn’t too tricky for low-level vertical work. That said, when it comes time to tackle the top of your unruly English Yew, this model is in its element, despite it being top heavy. Simply angle the head at 90º and scythe, baby, scythe. You should get around 45 minutes of running time out of the battery but be prepared to wait up to four hours for it to charge. The titchy Bosch Shrub Shear notwithstanding, the HT20’s blade is shorter than others in this roundup (31.5cm) so it’s not the model to choose if you have 100 metres of hedgerow to manicure, but for everyday urban use it’s a cracker. By their very nature hedges are often found around the edges of gardens and other areas, which means they’re as far away from electrical sockets as you can get. Cordless trimmers solve that problem as well as the safety issues of having a cable hanging out of an electric cutting tool, but as hedges can often be substantial you need to be sure the batteries are up to the job. Stihl’s AK10 battery (included) runs for 40 minutes, and the optional AK20 and AK30 deliver 80 and 120 minutes respectively. Stihl’s famous for its professional saws and other tools, and this is a typically safe and solid cutter with relatively low weight and low noise backed by Stihl’s usual build quality. At this price you’d expect a trimmer so weak it could barely threaten a hedge, let alone do anything to it. But the VonHaus isn’t bad for the money. There’s a 550W motor and a 61cm cutting blade that oscillates at 1700/m, a 10m cable so you can actually reach things and a fairly lightweight 3.5kg so you won’t get sore arms. It’s a little bit clattery, but you expect that with budget power tools - and with Amazon selling the trimmer for nearly half price, you can afford to invest in some nice ear muffs if you don’t like the sound. It’s unlikely to last long enough to pass on to your grandkids, but it’s both cheap and cheerful. Trimming really wide hedges can be a real pain, but the longer your cutting blade the less of a pain they become. The Bosch is fairly light at 3.9kg but its cutting blade is an exceptionally long 700mm, with a tooth spacing of 34mm and a sawing function for branches that are too thick to fit between the teeth. The 700W motor should make light work of even the toughest hedge, and that long reach means you don’t need to do ladder acrobatics to reach tricky bits. It’s corded rather than cordless - a decent Lithium Ion battery would have added a lot of weight and expense. That’s probably for the best, mind: you don’t want to lose power halfway through taming a huge hedge. 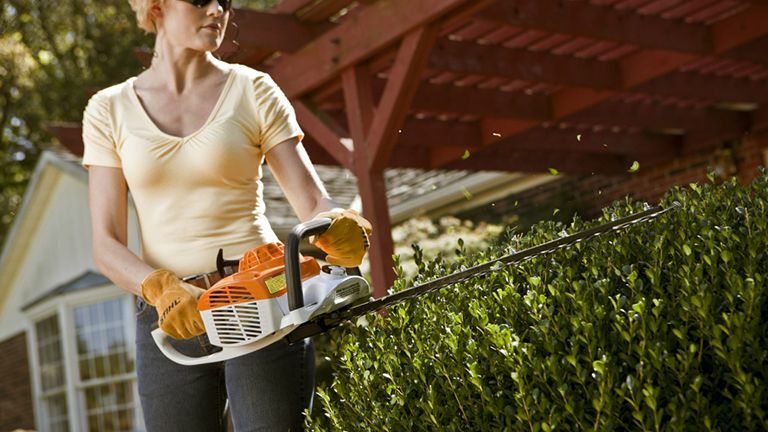 This B&D cordless entry comes equipped with an amply long 55cm dual-action blade that snips through larger hedge branches up to 15mm thick with ease, thanks in part to the 22mm gap between each blade, the powerful 36v lithium battery (swappable with other B&D power gear) and Black & Decker’s E-drive technology. Despite the lack of a telescopic arm, this is a great option for long periods of eye-level hedge trimming. Its battery provides around 50 minutes of use on a single 90-minute charge, it’s comfortable in the hand and, at 3.1kgs, it isn’t overly heavy for anyone with average sized biceps and deltoids. This hedge trimmer has garnered a wealth of mostly very favourable reviews; the majority of users are thrilled with their purchase and love the way it tackles thicker hedging without slowing down. There are quite a few small handheld hedge trimmers around - Bosch alone makes several different models, and lots of rivals do too - but we think this set offers the best combination of usefulness and flexibility. The 10.8V Lithium Ion battery runs for 100 minutes between charges (recharging takes 3.5 hours from flat), there’s a choice of a 10cm grass blade, 12cm shrub blade or 20cm shrub blade, and the tool-free blade switching couldn’t be simpler. The real draw here is the weight: at just 900g, you won’t end up with a bad case of Gorilla Arm after using it for protracted pruning. You wouldn’t want to prune a Victorian maze with it, but for relatively titchy topiary it’s ideal.